I love Hamlet, so glad to see you enjoyed it as well. It sounds like you are really enjoying Shakespeare Reading Month! Wow, it has been a long time since I've seen a review of Hamlet (since high school I think.) Cool idea to return to the classics. Hugger-mugger is new to me. Brilliant though, I am going to use any excuse to use that at some point. Although I am sure it will just get me strange looks. This is my next one and I'm looking forward to it. If you are going for a comedy I recommend Much Ado About Nothing. No one dies! Plus I didn't have to read the explanations in the back that often. One of his easier plays I think (no hugger-mugger). Great for beginners like myself. Love this review. 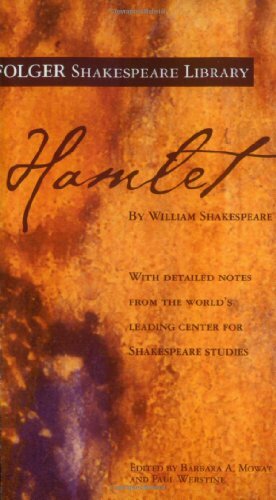 It has been years since I've read this play - but one reason that I love my Complete Book of Shakespeare is that there is a column on each page which effectively "translates" Shakespeare's English into something more like our own. Very helpful!